For those of you who don't already know them, 'She & Him' are actress Zooey Deschanel and musician, M Ward. I think most people who have ever seen 'She & Him' perform live would agree that it's more like 'She' and 'a little bit of Him'. She is very much the face and voice basking in the spotlight, He is more the all in black traditional axeman contributing occasional vocals. 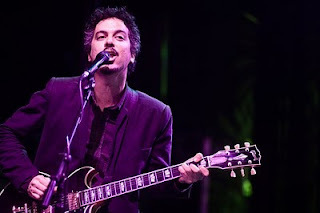 Those of you who read this blog regularly will know I'm a major fan of M Ward and I'll be honest, unlike most of the people there on Friday, I was there to hear M Ward rather than Zooey. Given this fact, there was a risk I would perhaps be a little disappointed since, well, it wasn't an M Ward concert and also I can't say their second album, Volume 2 has really excited me all that much. As it happens, the outcome was quite the contrary, I really enjoyed myself. I'm not going to write a detailed review, I was after all there on my wedding anniversary so it would feel wrong! So here are a few points of note. Friday night was She & Him's (Her & His?) first ever London concert. 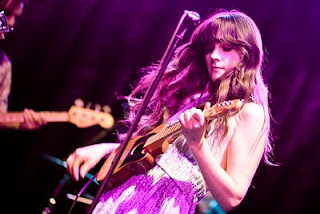 For any doubters, Zooey really can sing. A powerful yet tender delivery of 'I Put A Spell On You' gave her the perfect opportunity to showboat her vocals. M Ward played 'Magic Trick' straight after MrChalky told me how cool it would be if he played it. Spooky! If you like Volume 1 more than Volume 2 it's still most definitely worth going to see them live, just look at the bumper set list below. The last five songs were by far the best sounding (along with 'Magic Trick' of course). The last song before the first encore, 'Sweet Darlin'' was simply stunning and they could have easily finished the show on a high right there but to come back with three more fantastic songs was simply awesome! If the super camp/drunk guy at the back of Koko's singing and dancing along to Zooey singing 'I Put A Spell On You' is any measure of audience approval, I'd say they scored 10/10. A great night with fantastic company.